Egg rolls were one of those foods that I always ordered if I was getting Chinese food. Until I met my husband and he ruined everything. He doesn’t like deep fried food. I don’t know what is wrong with that guy, but he was aghast at my insistence that we order them. I didn’t want an ENTIRE order to myself so I didn’t get them. After 13 years with my partner, I have stopped eating them. I did decide to try to make them to see if I could approximate the crispy, salty, tangy confection that is an egg roll. Of course, I wanted to do it without deep frying so I baked them. The number that should blow your mind is the sodium. That is ONE egg roll folks and is your meal going to end there? 1100 milligrams of sodium is 46% of your daily value and more than the sodium you would find in an ENTIRE Big Mac (970 mg). My egg roll is all vegetables and is a little bit of work. First, you must make the filling and then you roll it up into egg roll wrappers. The wrappers can usually be found next to the produce section in a refrigerated case. I use my food processor to do all the heavy chopping to save time – mince the garlic, ginger, onion, mushrooms and shred the carrot and cabbage. The Hoisin sauce can be found in the “Asian” section of your supermarket next to the soy sauce. Do use fresh ginger for this recipe. It has a great punch of flavor that makes this work since you are using much less salt. This is a good job for someone who is sitting around trying to watch TV or read a book. Put them to work! 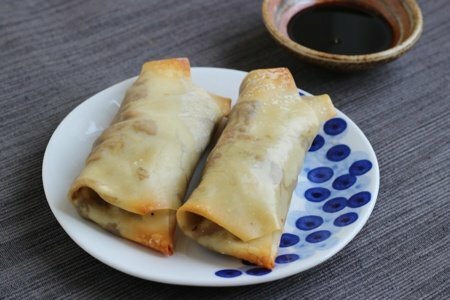 Have you tried to make your own egg rolls? Preheat oven to 400 F. Spray a rimmed baking sheet with canola oil or olive oil. Heat vegetable oil in a large saucepan over medium high heat. Add onion, garlic, and ginger and sauté until the onion softens (3-5 minutes). Add carrots, cabbage, mushrooms, Hoisin sauce, and soy sauce and sauté for another 5 minutes until the cabbage has softened and the flavors have melded. To assemble egg rolls, put ¼ cup filling in the center of the wrapper and follow the package directions. Basically, you make an envelope with the filling in the center. Spray finished egg rolls with canola or olive oil and bake for 12-15 minutes until browned. Serve immediately to ensure crispiness with mustard for dipping. I wonder if those thin rice wraps would work for this recipe? I don't think they can be baked, but maybe heated gently in the microwave or not at all. So how did they compare to authentic egg/spring rolls and did your husband like them? They look/sound delicious. I'm fortunate enough to have a low-salt Asian restaurant nearby (Jai Mei). Their veg spring rolls are not quite but nearly raw inside which I like; I think the light fry is the only cooking they get. I have very low BP so I dip them in Shuyu Sauce for salty flavor and I only eat one. I might try my hand at these someday with minced shrimp too. Thanks for the inspiration! I always make my own (unless I feel lazy in which case I buy the frozen ones from the local store). The great news about making them is, not only can you control the sodium content, you can also control what you put in them. Meat, seafood, game meat, vegetarian, mushroom, dessert. I don't recommend rice wrappers are cooking them makes them gummy. Egg roll or wonton wrappers work great and I have even had success with phyllo. To bake them and get them real crispy the trick is to crank the oven to 500 F, brush or spray the rolls with a little bit of oil or butter, stick them in the oven and immediately reduce the heat to 400 F (just like roasting a chicken to get crispy skin). My dipping sauce of choice is Sweet Thai Chilli sauce for the sweet and spicy kick... that or sriracha. I have been getting a CSA and sometimes do not know what to do with the cabbage or bok choy so have made eggrolls with both. I use basically whatever I have on hand which is usually carrots, cabbage or bok choy, onions, mushrooms and green onions. I have even thrown celery in. If I have ginger I use it but have made them without and they are good. I use a sweet and sour sauce to cook them in first and they are delicious! It is hard to find a true vegetarian eggroll around here, the spring rolls usually have seafood, so this satisfies me when I want an eggroll. Can these be frozen if you make a large batch? What a great recipe, however i always fry ours. I use coconut oil and if the oil is hot enough the eggrolls (or any fried food) do not come out greasy. If one puts food in oil that is not hot enough, it will come out greasy and unappetizing. I would suggest using Napa cabbage as it is not as hard as regular cabbage and is used more often for eggrolls, potstickers (gyoza) and wonton. Use a small amount of sesame oil for great Asian flavor. I recently filled some rice paper spring roll wrappers with a bag of about-to-expire Costco kale broccoli salad mix - just lightly stir fried, added green onions, avocado, soy and hoisin sauce. Yum! Thank you for the advice Shelley. Much appreciated! Its Amazing Recipe.I like it.Thanks for sharing. @kitty - Yup. Good recipes bear repeating, right? Not everyone has read this recipe. I can't read the posts to this site every day so I appreciate some repeat info. One can always move on to another site. That is the beauty of the net. I just made egg rolls at home several times after attending an Asian cooking class, and then reading your post. The first time I doubled the batch using ground lower fat pork sausage in half and diced shrimp in the other. We loved the crunch of cabbage, carrots, and water chestnuts together. Second batch I shortened prep time using bagged broccoli slaw from the market. You can also bake the filling before assembling the egg rolls, on a cookie sheet for 30 min to remove excess moisture. Helps to avoid sogginess during baking. I sealed the egg rolls with banana after rolling them up. Peel the banana back and use to moisten the edges. Works well. After brushing with olive oil, they came out of the oven crunchy, and not greasy. I made dipping sauce with apricot jam, rice vinegar, and a dash of pepper flakes. My husband thought they were great and liked that they were healthier. They can be frozen and reheat nicely. A good side for a stir-fry. Looks very delicious, I am gonna try this at home. I have eat lots of EEG rolls in my local market, but never try to cook at home. Finally i decided that i will try this recipe at home and will share my experience with you. Thanks for sharing delicious recipe with us. What an extraordinary recipe, on the other hand i generally sear our own. I utilize coconut oil and if the oil is sufficiently hot the eggrolls or any seared sustenance don't turn out oily. Listen to the following words of customers who bought The Ugly Feet Handbook“I must say this is without a doubt the best product for reconditioning The Ugly Feet Handbook. http://www.probesalokamachines.com/576.html I have purchased The Ugly Feet Handbook in the past but none of them came close to the amount of detail in this.